Photonics is a key technology of this century. The combination of photonics and silicon technology is of great importance because of the potentiality of coupling electronics and optical functions on a single chip. Many experimental and theoretical studies have been performed to understand and design the photonic properties of silicon nanocrystals. Generation of light in silicon is a challenging perspective in the field; however, the issue of light-emitting devices does not limit the activity in the field. Research is also focused on light modulators, optical waveguides and interconnectors, optical amplifiers, detectors, memory elements, photonic crystals, etc. A particularly important task of silicon nanostructures is to generate electrical energy from solar light. Understanding the optical properties of silicon-based materials is central in designing photonic components. It is not possible to control the optical properties of nanoparticles without fundamental information on their microscopic structure, which explains a large number of theoretical works on this subject. Many fundamental and practical problems should be solved in order to develop this technology. In addition to open fundamental questions, it is even more difficult to develop the known experimental results towards practical realization. However, the world market for silicon photonics is expected to be huge; thus, more research activity in the field of silicon nanophotonics is expected in the future. This book describes different aspects of silicon nanophotonics, from fundamental issues to practical devices. The second edition is essentially different from the book published in 2008. Eight chapters of the first edition are not included in the new book, because the recent progress on those topics has not been large enough. Instead, seven new chapters appear. The other eight chapters are essentially modified to describe recent achievements in the field. Silicon Nanocrystals Enabling Silicon Photonics. Silicon Nanostructures for Photonics and Photovoltaics: Ab initio Results. Modeling Nonlinear Optical Phenomena in Silicon-Nanocrystal Structures. Band Structure of Silicon Nanocrystals. Engineering the Optical Response of Nanostructured Silicon. Room Temperature Light Emission from Silicon Nanowires Fabricated by a Metal-Assisted Wet Etching Process. All-Inorganic Colloidal Silicon Nanocrystals. Engineering Nonlinear Sources with Silicon-Compatible Optical Materials. Light Emission from Silicon-Based Materials: From Silicon Nanostructures to Rare Earth Ions. Silicon Nanocrystals in Silica: Optical Properties and Laser Annealing. Information Capacity of Silicon Nanophotonics. Silicon Nanocrystal Memories. Nanostructured Silicon Light Emitters. Silicon Nanostructures for Photovoltaics. Biological Applications of Silicon Nanostructures. Leonid Khriachtchev graduated from the Leningrad State University, Russia, in 1981. He completed his PhD in quantum electronics in 1986 and became a senior scientist and group leader in 1988 in the Institute of Physics at the same university. At that time, his research dealt with resonant light pressure and optical pumping of the ground state of atoms in the gas phase. In 1994, he joined the University of Helsinki, Finland, and he is currently a senior scientist in the Department of Chemistry at this university. His scientific activities are focused on experimental spectroscopy of various molecular species and nanoscale materials. He has contributed to the construction of new chemical systems at low temperatures, including noble-gas compounds and high-energy conformers. Silicon-based photonics has been another important part of his research activity. He is the editor of Silicon Nanophotonics: Basic Principles, Present Status, and Perspectives (Pan Stanford Publishing, 2008) and Physics and Chemistry at Low Temperatures (Pan Stanford Publishing, 2011). He is also the author of over 240 refereed articles. 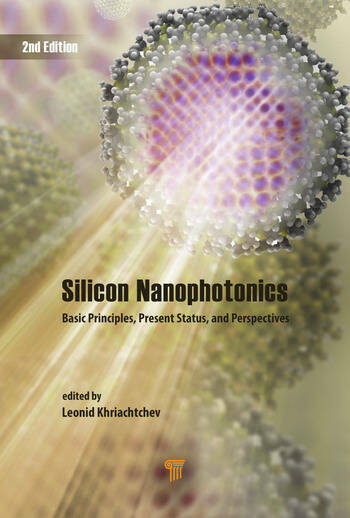 "Silicon Nanophotonics, edited by Leonid Khriachtchev, is a most useful and up-to-date collection of review articles covering the various aspects of silicon-based photonics, written by leading experts in the area. Both theoretical and experimental issues of silicon nanocrystals are considered, as well as device applications in both solid-state photonics and biology. This volume is an essential read for those working to make silicon shine as optoelectronics material."